A few posts back I mentioned that it was 'Time to Paint a Warbler'. That was after numerous field sketches. 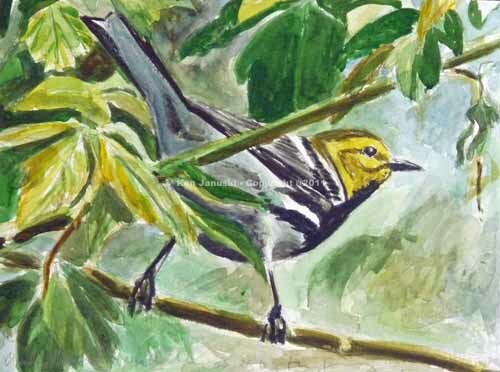 This weekend, when it's really too hot and uncomfortable to do much outside, it seems like the right time to renew my attempts at warbler paintings. I'll confess I don't like most warbler paintings I see. They either slavishly copy a photograph, having all the excitement of a photograph slavishly copied, do a fair job of creating a lively portrait of a warbler but then have no idea what to do with the background, if there even is one, or more likely do a watercolor, mainly in light washes, that looks like a pale imitation of what is really a brilliantly colored wood warbler. Every once in a while, when I have such a dilemma, I'll pull out my baby elephant reproduction version of Audubon's prints of American birds. Rarely am I disappointed. But yesterday I was. From what I can tell Audubon didn't use as much the artistic imagination and adventurousness that he uses in many of his plates in these. Almost all are perched on what I surmise is relevant foliage. Perhaps if I look on another day my view will change and I'll see his typical artistry. In any case they weren't much help yesterday. 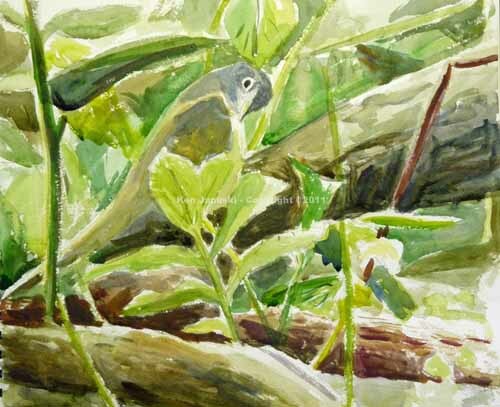 Finally I decided to do something similar to many warbler renderings: paint a warbler among relevant foliage. Mine is tightly cropped however rather than showing more of the foliage as in Audubon and others. I would prefer to avoid this tight cropping because it often looks too much like something just copied from a photo. 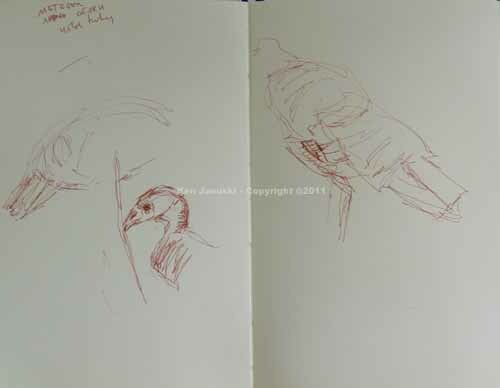 But I also wanted to accentuate the bird, and it was done more from one of my recent photos than from my field sketches. The watercolor above is a small one, about 5x9 inches. on watercolor paper. 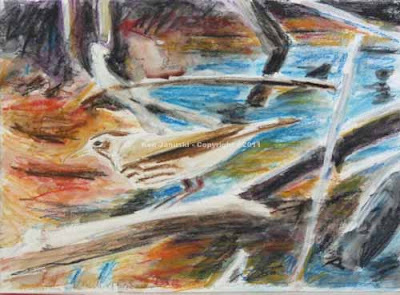 The difference is that he wants to create the same sense of passion in the viewer that he has as he views, and paints, the bird. There is a dichotomy in American wildlife art, and probably the wildlife art of many countries, between art and science. David J. Wagner in his wonderful book 'American Wildlife Art' uses Karl Rungius and Louis Agassiz Fuertes as well-known examples. Many people knowledgeable about birds prefer Fuertes to Audubon. This makes sense if you value science over art in wildlife art, not that Fuertes didn't also make very artistic paintings. He did and I in no way want to criticize him. I much regret that I didn't avail myself of the opportunity to study his work firsthand when I was a student at Cornell. 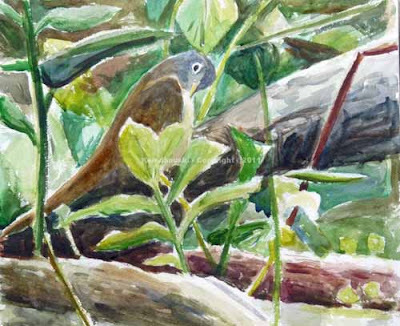 But Rungius was more aware of the art world and incorporated it in his own wildlife paintings. In my own work I continually struggle, especially with warblers, to create paintings that will make viewers see what I want them to see. There is an element of science in this, but in my work art always plays a larger part. This is a long route to saying that though I'm happy with this little painting I'm also disappointed in it. 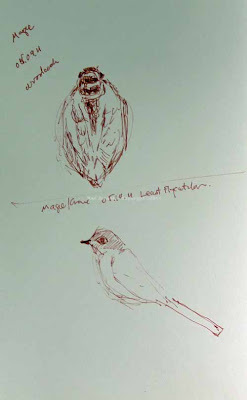 All my recent warbler works seem like studies. I, hopefully, am working my way to a more ambitious portrayal of what I want 'you' to see in the wood warblers. Before we left on our vacation I stocked up on some art supplies I thought might prove useful, in particular something that would allow me to quickly add color to field sketches. 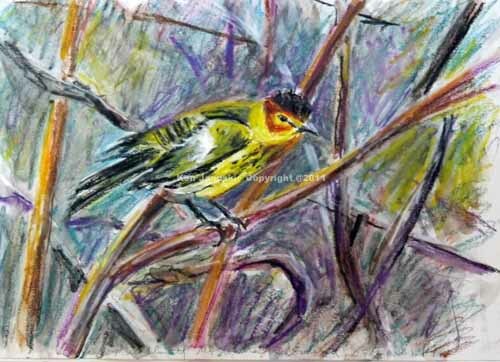 With many wood warblers on the horizon I wanted to be able to add color in the field, with the birds in front of me. I've tried watercolor pencils with no success or happiness. So this time I decided to try Caran d'Ache Neocolor crayons. They promised brilliance, a prerequisite for wood warblers, as well as the ability to lay lighter colors over dark. Well it made no difference. I never had the time, or room, to use them on the crowded boardwalk of Magee Marsh. 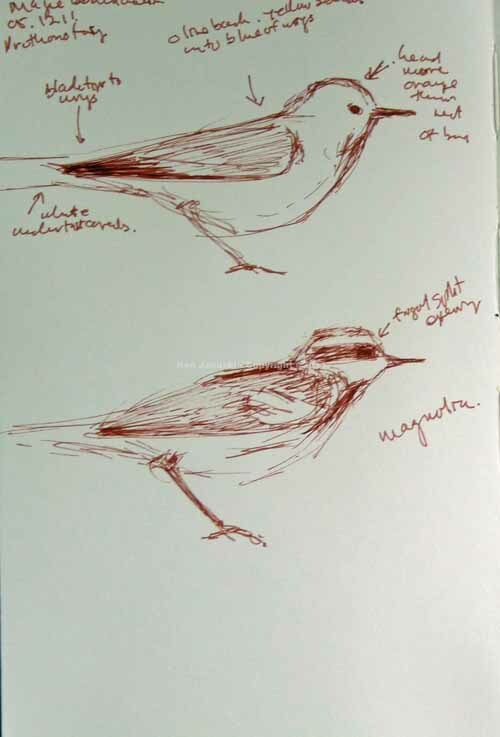 But since I've been home I've decided to give them a try on some warbler sketches, some based on field sketches, some based on photos I took. At top is a male Cape May warbler, shaking itself off after a dip in the stream. To me it's in the running for most beautiful wood warbler, though my wife turns up her nose at this thought and suggests it's a bit over the top. The orange/rust/rufous on cheek though is brilliant against the yellow and black of the rest of the head. I think the crayons capture this fairly well. What they don't do, and this is more my fault than theirs, is create a convincing background. We also saw a number of one of the more subtle warblers, the Northern Waterthrush. It tends to stay low near water and I'd hoped to set off the rich, colorful reflections in the water against the subdued browns of the bird itself. But a limited palette of just 10 colors left the richness I'd hoped for somewhat absent. Still these crayons allow me to work fast, to experiment, to try out ideas for paintings. It's taking awhile for me to work myself up to more ambitious work. I think these crayons works will be a productive step along the way. I've been looking forward, actually since last fall, to doing paintings of wood warblers once spring and summer got here. I had no expectation at all of skecthing African and other exotic birds. But an unexpected visit to the McNeil Avian Center at the Philadelphia Zoo with visiting relatives this weekend brought surprise opportunities. 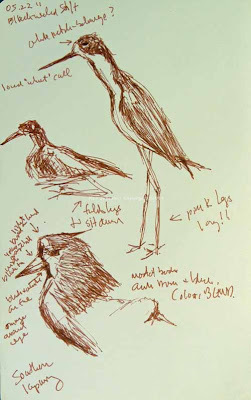 So some sketches of an Egyptian Plover, chasing around the much larger and higher Magpie Shrikes, as well as a Blue-breasted Kingfisher. Also a Black-necked Stilt, a bird that is often within a 2-hour drive of here at Bombay Hook NWR, and a Southern Lapwing. 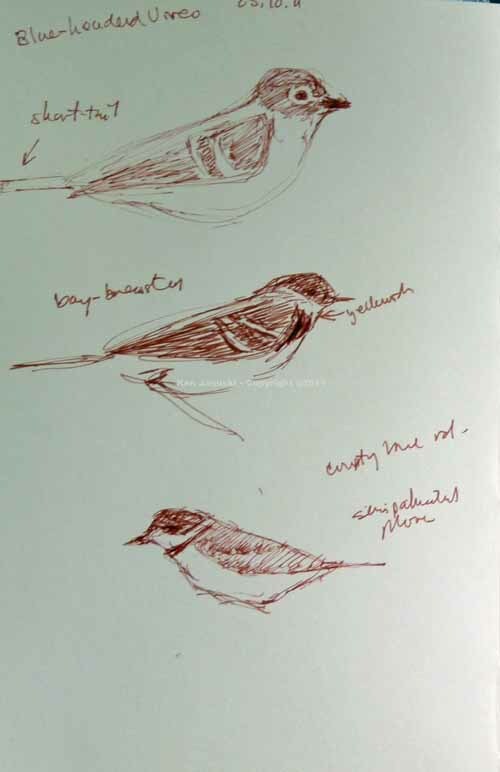 After many years of struggling to catch brief glimpses of birds in the field and then sketch them it's been getting easier and easier this year. First all the nearby wood warblers at Magee Marsh, then these really near birds at the zoo. I had less than 90 minutes to work on these so there was that pressure. But other than that it was quite a happy change. Most birds are seen for less than a second. These held still for a much longer time. I've never thought to much about animals in captivity and what I think about that. Partially this is because I so rarely go to zoos. But I can say that this was a real treat as far as having subject matter that didn't disappear for hours at a time. And of course there were all the other animals. I'll be going back to the zoo. And I know what probably struck me the most on the last visit, outside of the birds: an incredibly light on his feet rhinoceros. Surely it will appear in a field sketch sometime this coming summer. I didn't really have time to work on this today but just couldn't resist. I was trying to add a little more definition to the painting, to keep the sense of complexity and the hidden quality of the warbler, without going completely toward chaos. In doing so I made the painting a bit darker. But I think this is a better painting and possibly a bit more accurate. There are still a few minor areas that bother me some. Only time will tell whether or not I leave them be. No the "I" is not me, and the "You" is not anyone who reads this. My reference is to this well hidden but eagerly sought Connecticut Warbler on the boardwalk at Magee Marsh last week. He is the "I" ignoring all birders. I'm not the type of birder who goes to great effort to see a new species. I'll make some effort and I'm happy to see them but they're not a treasure hunt worth serious sacrifice. I think this may be a minority opinion. There are a lot of serious life bird searchers out there. But when someone tells me that there is a rarely seen warbler right in front of me, and down on the ground not out of sight 100' up I'll try to find it, see it, maybe even sketch it. Well I have to say that an hour later when we finally got a good look at this bird we both were ready to quit birding for the rest of the afternoon. This was just far too mentally exhausting! Why? Well I think this watercolor based on a photo I took shows why. This bird was buried in the ground foliage and forest detritus, much of which was taller than it was. And it wasn't in any hurry to move around and give potential viewers a clue as to its whereabouts. 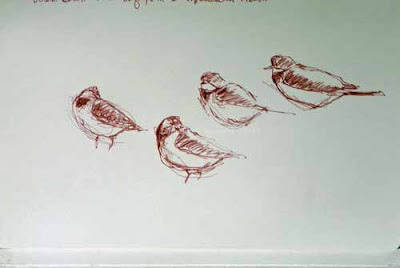 In fact there was plenty of time to just stop and do some preening. I particularly liked this photo when I discovered that some of my shots had actually captured it because of the extreme nonchalance the Connecticut Warbler showed in the face of at least 50 people at any given time trying to get a look at it. Many were trying to add it to their life list, a rare opportunity right there before them. I did a lot of sketches of warblers while I was there and showed most of them recently. I look forward to doing paintings or prints based on them. Photos will only be of secondary importance when I work on them. But here there was only this one photo. After hogging valuable boardwalk space for most of an hour we moved on as soon as we'd gotten a good look and I'd shot a couple of quick photos. It would have been too rude to then sit there and try to sketch him. This is a very busy, non-art week for me. I'd like to go back into this. But I suspect that I won't, at least this week. 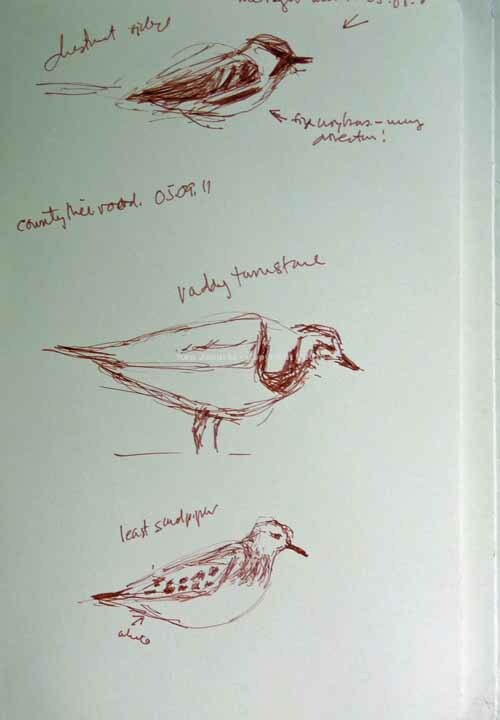 One of the truisms of field sketching of birds is that you should only put down on paper what you recall seeing. You shouldn't make guesses. I think the main reason for this is that you can then trust what you've put down, as little as it may be. This makes sense to me. But I have a hard time following it. I always want to put in something like the wing bars, or the bill, or the legs, assuming that I can make a good guess as to where they were and what they looked like. Often, if not most of the time, I'm wrong. I thought of this as I looked over the field sketches I did at Magee Marsh over the last two weeks. At the end of the day I'd often look through guides that I had, especially a Richard Crossley's new photographic guide, to compare sketches and photos. Inevitably I'd see where I had something wrong. But, at least for me, I'm not sure that this is bad. There's something about seeing that you've made a mistake, and often published it, that tends to make you notice, and remember, what you've done wrong. So for instance I noticed that my generic bills are often too thin, or too short, that my wingbars are placed too high or low on wing of some species, etc. I'm not sure I'd even know this if I didn't put down what I thought I'd seen and then found out I was wrong. 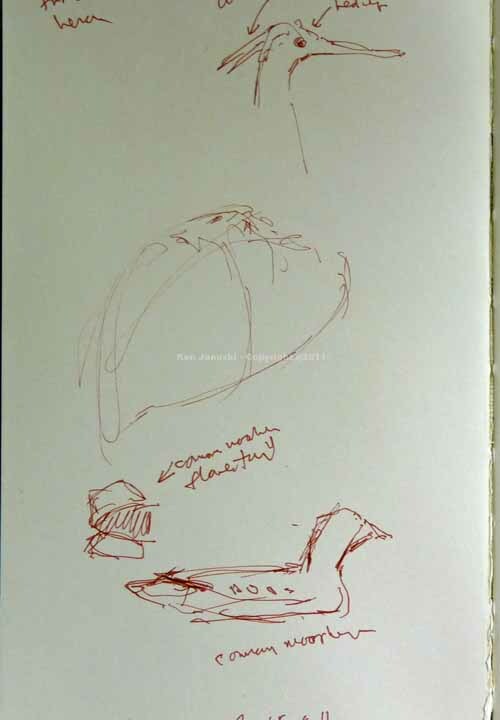 So I guess there are two ways to look at this: one, a sketchbook is a compendium of things truly seen, even if only in brief segments; and two, a sketchbook as merely a tool in learning to see and to sketch. I understand and can appreciate both. But for me at least I do see a lot of value in the second viewpoint. Oddly enough I thought of this at the very end of our trip. A wildlife rehab clinic had a display of injured raptors and owls in the Magee Marsh parking lot as we stopped to use the bathrooms on our way out. Bald Eagles, Peregrines, Red-shouldered Hawks, Saw-whet Owls, Barn Owls, etc. I had to tear myself away and resist getting out my sketchbook. But what really struck me was the way the peregrine lifted his wings up a bit, like a person shrugging his shoulders, and then let his wings hang down. I'd seen and sketched this exact pose on an Osprey I'd seen last fall. But when I got it home it looked thoroughly wrong. The bird almost looked wider than high because of the width of the shoulders. But when I saw the peregrine I knew that this was what the osprey had done. So my sketch was accurate even though it still looks thoroughly wrong. So there's the other side of the argument: the value of putting down exactly and only what you see. With that said the rest of my sketches. At top a number of Semi-palmated Plovers. Below a quick sketch of a Tri-colored Heron and a Common Moorhen. Below a 'Wild' Turkey, that acted as though is was a domesticated bird and not wild in the least. Still an opportunity I coulnd't resist. 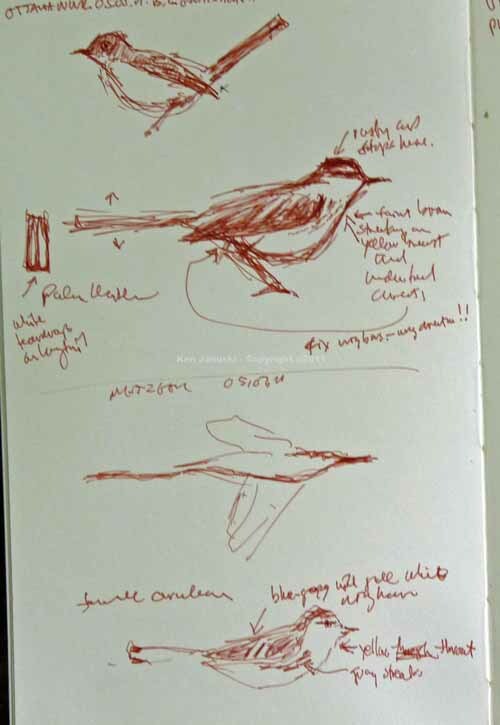 Below a Blue-gray Gnatcatcher, Palm Warbler, feeble attempt at Great Egret in flight, and a sketch of a female Cerulean Warbler. The last was interesting in that I actually using the sketch to make notes to help me ID the bird. It was only after I'd made this sketch that I and my wife, along with a few other observers, agrred that it was a female Cerulean. Below two of the last birds I sketched on our last auto tour of the NWR, a Swamp Sparrow and the first Willow Flycatcher of the year. 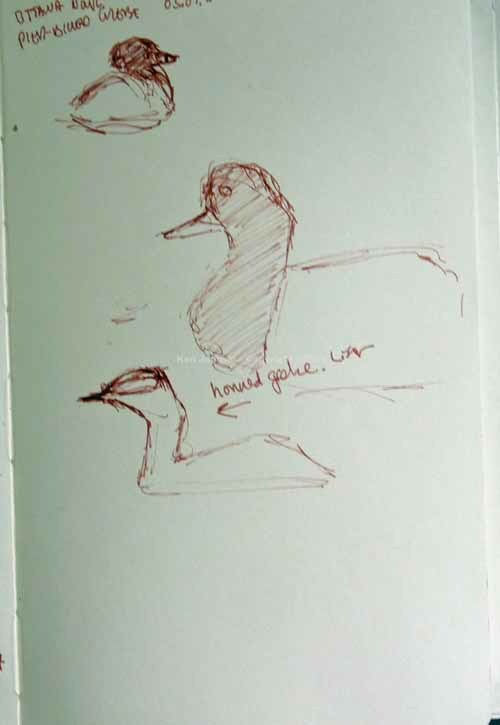 Below a Pied-billed Grebe, Lesser Scaup, and a lifer Horned-Grebe. The last surely seems worthy of a painting. I wish he hadn't been too far away to even think about taking a photo. And finally another Chestnut-sided Warbler, Ruddy Turnstone and Least Sandpiper. 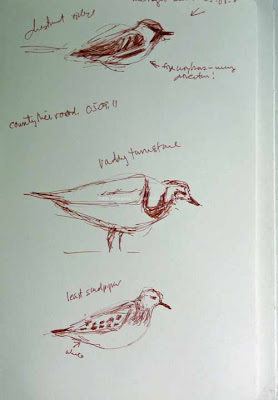 Sad to say the proportions of the head of both Turnstone and Sandpiper are off. And I viewed both through a scope. Even then though birds don't necessarily sit still. I think that both moved and so I tried to finish them off from memory. In both instances the heads were just too small. Soon it will be time to refamliarize myself with shorebirds. The last talk we went to at Magee was about fall birding in Ohio. 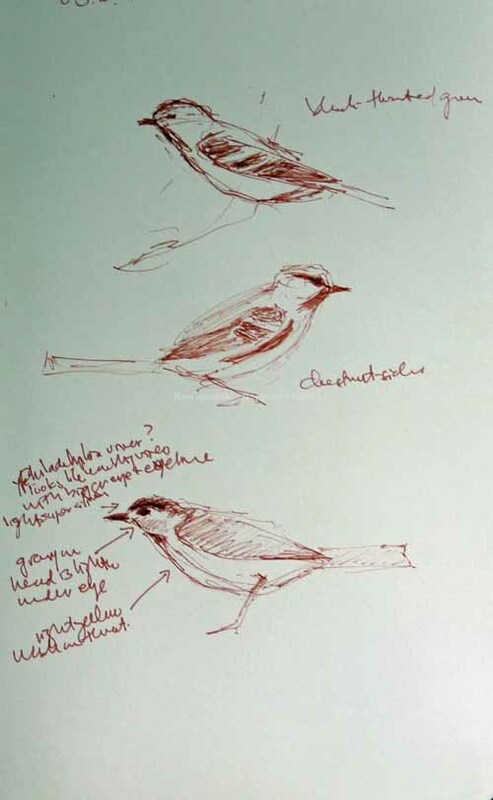 The speaker talked about the more subtle beauty of shorebirds as compared to breeding Wood Warblers. It's true that they do have their own unquestionable beauty. 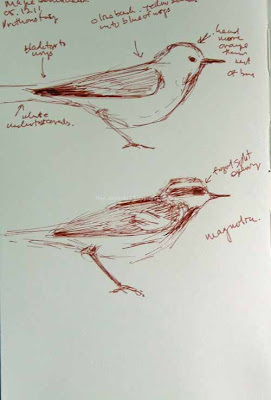 But for now it's time to proceed with warblers I think. Shorebirds will come soon enough. It advertised itself as 'The Biggest Week in American Birding.' Being a bit of a skeptic I would normally take such a phrase with a huge grain of salt. But we've birded the area around Magee Marsh and Ottawa NWR in NW Ohio numerous times in the fall and have seen a lot of birds. And we've both heard and read that it is far, far better birding in the spring, in particular for warblers. So this year we planned our vacation to put us there for most of the first two weeks of May. Since this time coincided with The Biggest Week in American Birding we registered for it and a number of talks and trips, all for a very low price. I really want to showcase the field sketches that I did there but I also want to commend everyone who was involved in planning the week. Much of the success of our trip was of course the birds. But for anyone like us, who signed up for various walks and talks, mainly by Kenn Kaufman, I also want to give credit to the humans involved. They did a wonderful job. I'm sure it was an exhausting 10-11 days for everyone at Ottawa NWR, Magee Marsh, Black Swamp Bird Observatory and all the others involved. For us it was a resounding success and we'd like to commend all of their work in making the human side of it run so smoothly. 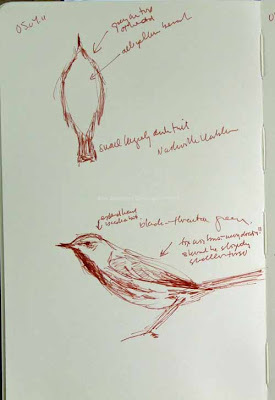 Anyone who follows this blog knows that both I and my wife love warblers and that I hoped this year I'd finally get some good field sketches of them. I'd guess we saw about 500 warblers during our time there, many within 6-12 feet. 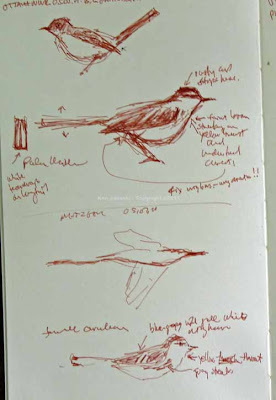 Though the boardwalk at Magee Marsh got incredibly crowded at times it still was an extraordinary chance to see and sketch warblers. When there is such a wealth of subject matter close by it's sometimes tempting to just take photos. And I took about 350. Or at least I kept that many. 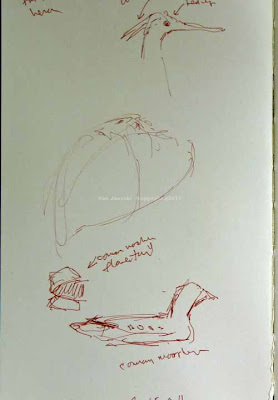 But on numerous days I forced myself to just look and sketch and not get out the camera. So without further ado. 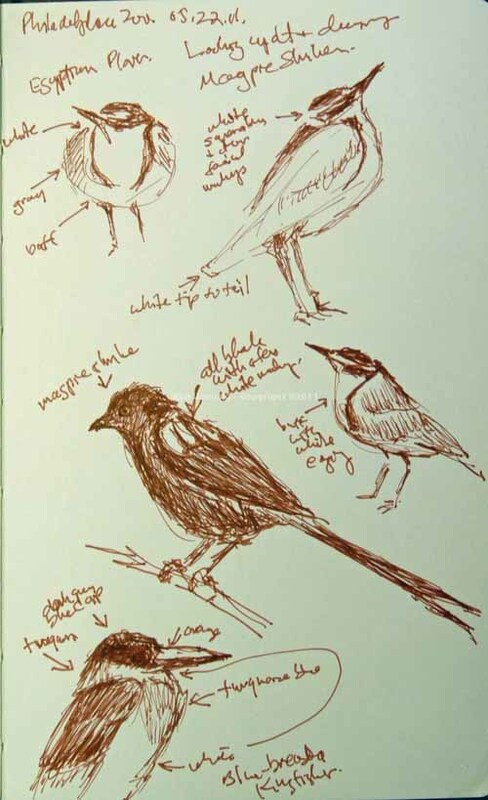 Most of these are done from looking at the bird, trying to get a mental image, and then putting it to paper. Inevitably I make mistakes in working this way. But I am improving. At top a Prothonotary and a Magnolia warbler. Face on Magnolia needs some work. Below a Nashville warbler seen from below, at least 50 feet up in the trees, as well as a Black-throated Green warbler. Below a Blue-headed Vireo, Bay-breasted Warbler and Semipalmated Plover. Below another Black-throated Green, Chestnut-sided and what I think was a Philadelphia Vireo. 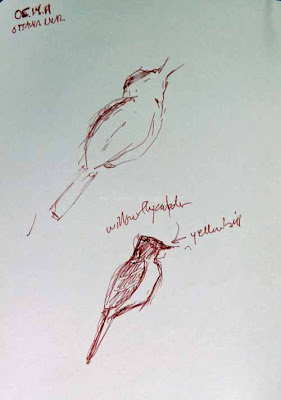 I used the sketch to help figure out what it was, basically a Warbling Vireo with an eye that seemed too big. And finishing off today's sketches an American Woodcock and a Least Flycatcher below. This includes about half of my sketches. Soon the other half. I've written in the past about how fieldsketching has been a struggle for me and how I've finally gotten comfortable with it. That really proved true here. There are numerous mistakes in these sketches. But there also is a wealth of material for future prints and paintings.